I admire the men and women behind the lenses who can portray the images that they want others to see or evoke emotions from the viewer. I can spend hours and hours of scanning photo images. Images amaze and mesmerize me. Landscape, seascape, and cityscape photos transport me to places I have never been anywhere in the world. Portraits, real people, real life, random street photos illicit within me the emotions of pity, sadness, happiness, and more. Food photos make me hungry and make my palate wanting to try them all. Most of all, I love images that tell a story. I am no master story-teller and since I can relate with beautiful images, I hope to convey what I see using photos. After a long walk from the ferry building to Ghirardelli square, a vast expanse of green sloping meadows that overlook the bay was very enticing for a sit down. 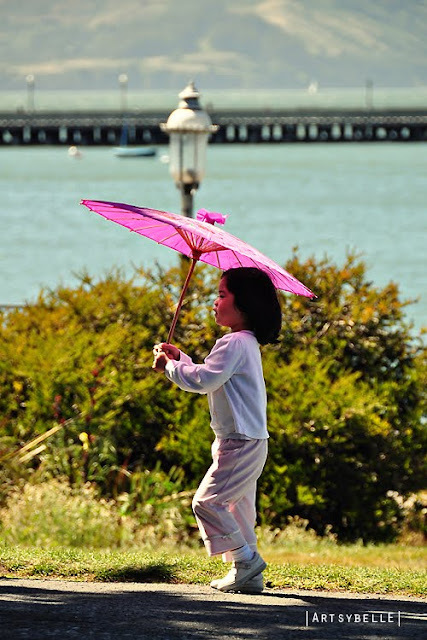 While relaxing my tired feet on the meadow, a child with a traditional Asian umbrella caught my eye. 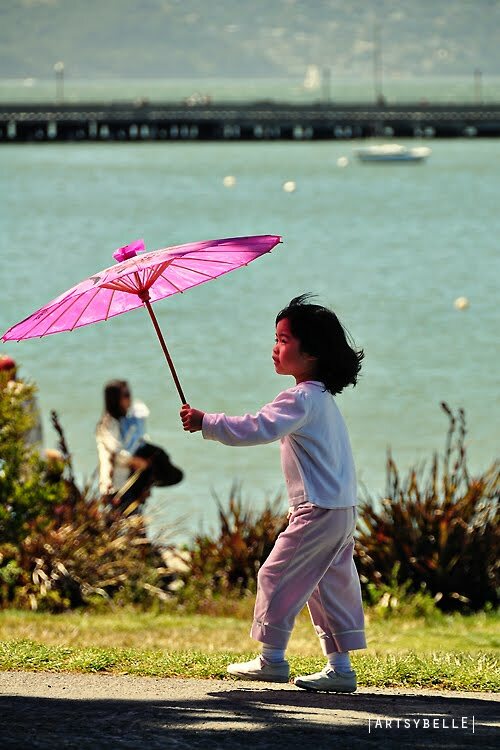 She looked so cute twirling and playing with the umbrella. It was a good thing that I had the camera out from my bag and ready for a shot. She was oblivious to her surroundings while she got busy with her umbrella. I could tell she was having fun. Of course, since I love images, I love cameras too and a giveaway from Twisted Halo is something that I covet. Check out her blog at Eternal Sunshine.